All silver jewellery above the hall marking weight has been stamped by the London assay office with the traditional sterling silver marks and the one for the London assay office. My own personal sponsor mark is also added to each piece of jewellery. There is a large range of individual handmade chains made from sterling silver sheet and wire. Some have been hammered, patterned or flattened. 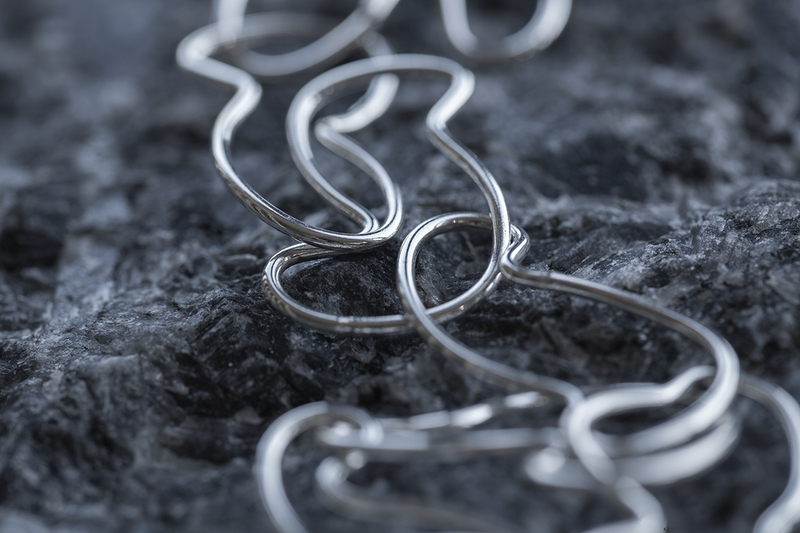 Links have been twisted and shaped to create a pleasing look and there is a range of loop in loop chains. Some of these have been made with bigger links to create a three dimensional effect. Flowers feature heavily the in the jewellery and they are all individually handmade and then made into pendants, earrings, rings and necklaces. The flowers usually have a pattern imprinted into the surface of the silver and stamens are added in the shape of wires with balled ends. Some of the smaller flowers and sprigs have a single stamen and some of the larger flowers have three stamen added. Sometimes a flat shape of flowers is cut out with a jewellers saw. Leaves feature quite heavily in number of pieces from sycamore, oak leaves to gingko leaves. 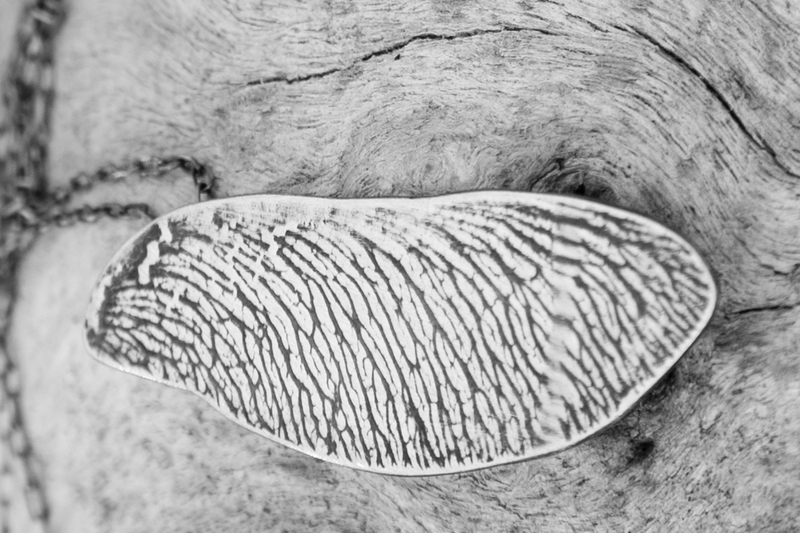 An impression of the leaf is imprinted into the silver and the shape of the leaf cut out with a jewellers saw. Some of the leaves are in frames or curved up to give a more three dimensional form. For 2018 a free formed collection has been created for scrap and re-cycled silver. 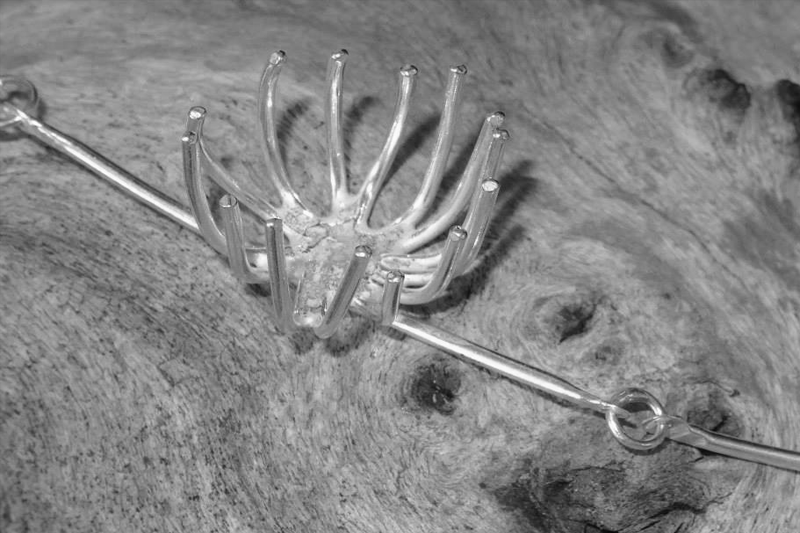 The silver is heated and allowed to melt and form together, each piece is different and unique. I took a sculpture course at my local college for two years and made three dimensional forms with seed heads and a germination series. These have been made from plaster and a finish has been applied to finish the piece. 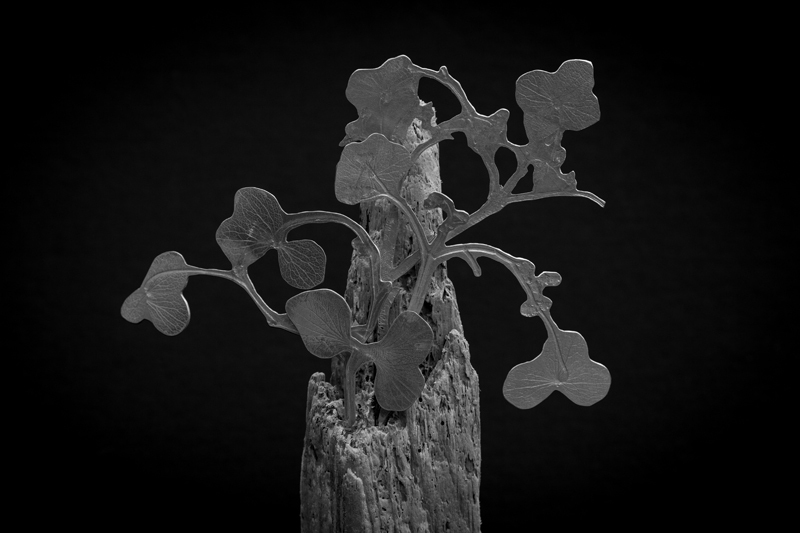 Other pieces have been made from aluminium, mainly flowers and leaves and have been added to driftwood. 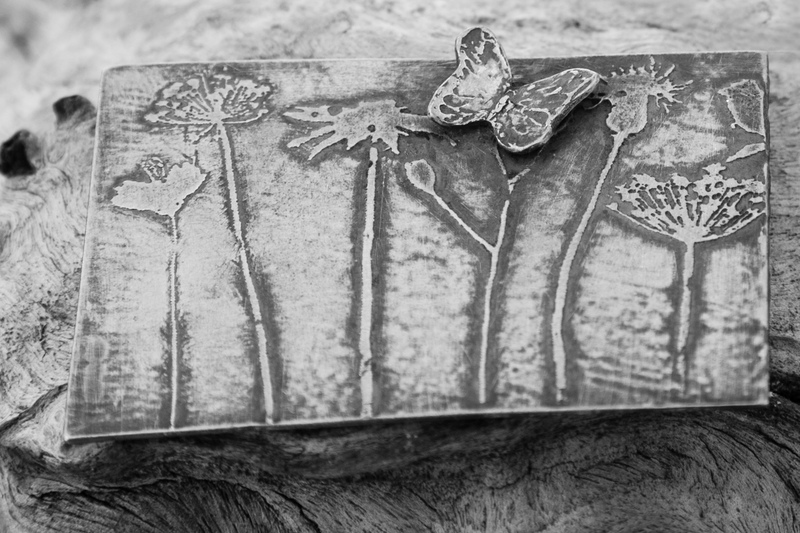 Poppy seed heads have been sand cast to form a nice solid three dimensional shaped piece. There is a large range of mixed media accessories made from hand made felt in the form of corsages. Aluminium has been printed, transfer printed, and textiles applied to create a range of light wearable distinctive, brooches, earrings and necklaces. Resin is sometimes used with textiles to create brooches and necklaces.